Another Service Bodies Australia innovation is ISUZU’s Servicepack-X available on NLR and the AWD NLS* that builds on the outstanding success of the first-generation Servicepack range launched in 2016. Ongoing development and innovation has seen the introduction of central lockable storage units, featuring ‘gullwing doors’ that open vertically, making it even easier to access tools, parts and equipment. With operator ease and OHS principles uppermost in its design, the ‘gullwing doors’ of the Servicepack-X offers protection from the weather and its unrivalled versatility ensures it’s suitable to a broader range of applications. The Servicepack-X also features a rear deck area engineered to fit a range of equipment including generators, high-pressure cleaners, and other plant-type equipment designed to run outside. 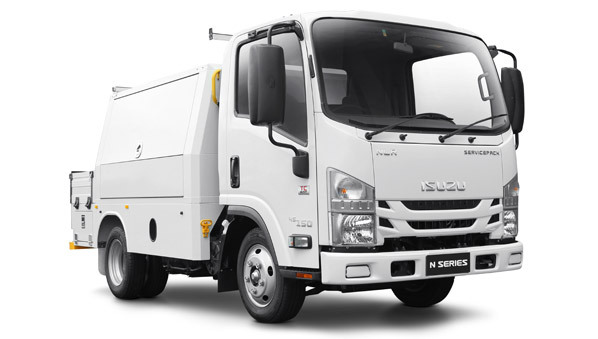 *NLS variations are available from participating ISUZU Dealers.